Here’s another neat little feature that iOS 7 has added for those of us who use an iPad with cellular data capability. 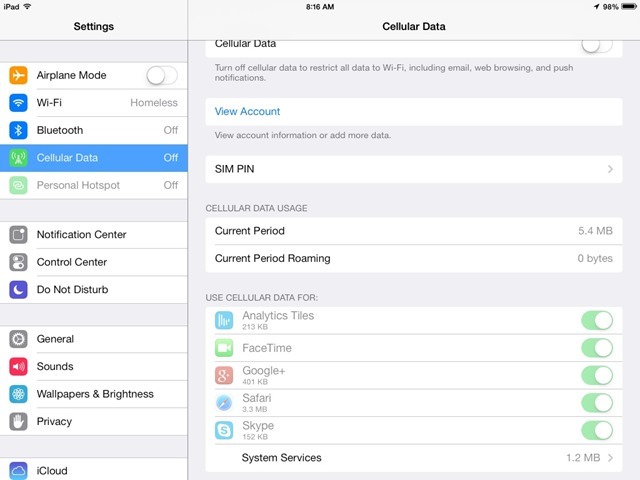 You can now see cellular data usage for all your individual apps in the Settings app. This was possible before with a few 3rd party apps, but it’s handy to have this information available right within the Settings app. You can find it in Settings > Cellular Data, in the new ‘Use Cellular Data For’ section. Apps are listed alphabetically an each shows its data usage in the current month. You can also use the button next to each app’s name to turn on or off its ability to make use of cellular data. I spotted this via Mac OS X Hints.